1.Nangka filtered and washed, because the water preserved to make a sour taste. 2. Stir-fry ground ingredients until fragrant, put brown sugar and bay leaves. 3. Enter the jackfruit and boiled eggs, stirring until thoroughly blended with spices. 4. Add coconut milk and water until all jackfruit tea and eggs submerged. 5. Cover the pan and cook over low heat. Do not often open, just 1 / 2 hours. 6. If it is long enough to try diicipi have to taste what is not. 7. Enter to know when the water left over a half, so know not too hard. 8. Cook until the water is low / almost dry. 9. 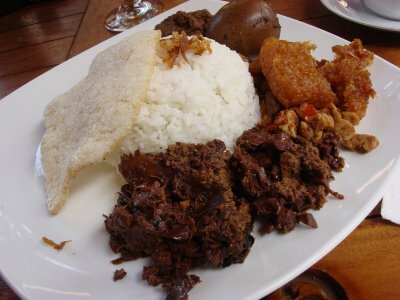 Ready to serve and eat with hot white rice and sambal shrimp paste, or it could be with meat or chicken as a side dish Empal enhancements. 2. Saute with a little oil until slightly dry. indonesiasecretkitchen. Watermark theme. Powered by Blogger.